This eight night holiday is, quite simply, outstanding in every way - think rich scenery, fantastically contrasting hotels, superb local cuisine and exceptional wines. You'll start off in Volterra, a beautifully preserved hilltop gem whose eclectic mix of Etruscan, Roman and Renaissance art and architecture has inspired artists and writers for centuries. From here, you pedal north east along quiet, rolling country lanes as you coast towards honey-coloured Pancole, nestled in the Tuscan hills. The cycling is truly glorious as you continue, via fortified towns and hill villages, to medieval Colle, from where you can also head to Florence and Siena for day trips. Then it's on to Pescille, which is perfectly positioned overlooking San Gimignano. Your final stretch takes you through a timeless and kaleidoscopic landscape of ochre-coloured hills and verdant vineyards, giving you a real sense of achievement as you loop back to Volterra for your final night. Superb 3-star and 4-star contrasting hotels, all with sparkling swimming pools, are an added highlight of this holiday. 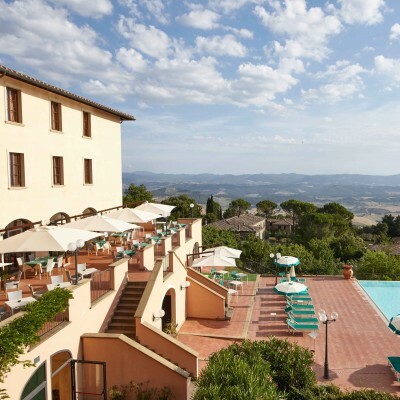 In Colle di Val d'Elsa, you stay in a fabulously restored 12th century Benedictine abbey, complete with original frescoes, whilst in Volterra, your 4-star hotel has a panoramic infinity pool, with stunning, sweeping views over the Tuscan countryside. Of course, you're in the heart of some of Europe's finest wine country too, so you'll never be short of tasting opportunities. Read more about this holiday in The Sunday Times. Arrive in Volterra where you've time for a dip in the pool and a wander round its myriad of cobbled alleys and hidden squares before dinner. Today it's a downhill whizz out of hilltop Volterra and into the pretty Era Valley where spectacular views of the surrounding timeless Tuscan countryside open up as you pedal. After climbing out of the valley, you'll soon pass through the pretty hamlet of Castagno where we suggest a well-deserved coffee stop in the local bar. 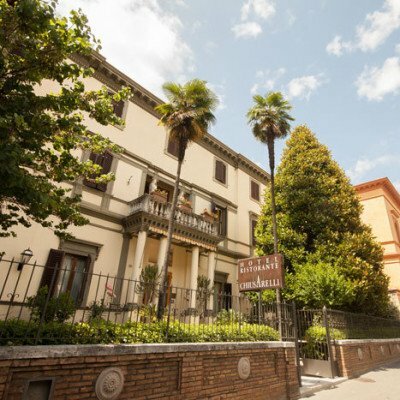 Your route continues on to Gambassi Terme, a well-preserved spa town with cobbled streets, 12th century church and lovely shaded gardens. Lunch here perhaps in one of the many trattorie then, soon after leaving the town, you'll pick up the famous Via Francigena for the gentle, mainly downhill stretch to medieval Certaldo where you can stop for a gelato before your final climb through olive groves and vineyards to the hamlet of Pancole. RIDE PLUS - 75km / 47mi Leaving Volterra drop down into the valley heading north, passing the Theatre of Silence and the family home of Andrea Bocceli. Ride past rich green meadows and stunning countryside and on to the pretty spa town of Gambassi Terme. A long downhill ride lets you roll into Certaldo before a short climb to your peaceful hotel Le Renaie for the next two nights. If you fancy a day off from cycling, the pool here is simply gorgeous and nice lunches are served on the geranium-scented terrace. There's also a small shop where you can buy olive oils, produced by the owners, and Tuscan wines. The more energetic might want to cycle past orchards and vines to visit Boccaccio's birthplace, stunning Certaldo. Take the funicular to its medieval centre for spectacular views across the Val d'Elsa. Today's route explores the panoramic wine country between Pancole and Colle di Val d'Elsa. You'll first retrace your route to Certaldo and then follow the official, mainly off-road, Chianti Wine Route where you'll find lots of tasting opportunities - don't forget, we can collect any purchases for you! It's then on to the old town of Poggibonsi, a perfect stop for lunch and to visit the ruins of its unfinished C15 fortress. The day ends with gentle pedalling through tree-lined meadows and a valley of poppy and sunflower fields to Colle di Val d'Elsa. 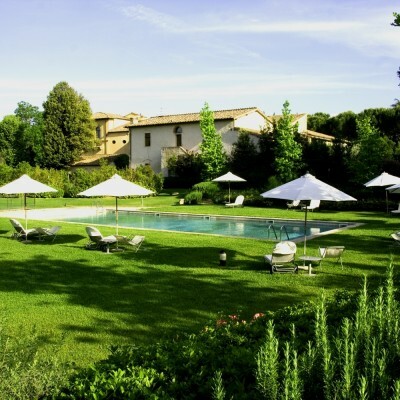 There's masses of choice today: explore the medieval old town which dates back to Etruscan times; take the bus to Siena (30 mins) or to Florence (60 mins); take in the medieval town of Monteriggioni, an easy cycle or short bus ride away; or simply laze by your hotel's sparkling swimming pool, surrounded by lovely gardens. It's easy pedalling this morning as you head south past the old town of Colle di Val d'Elsa, gradually climbing up to Casole d'Elsa, a beautiful village characterised by ancient vermilion-hued buildings and blessed with stunning views from its hilltop position. Take time to explore its C12 church (frescoes by Gano da Siena) and impressive fortress before an early lunch perhaps, in the lovely piazza. You then wind north, gently uphill, through wonderfully scenic countryside against the backdrop of the impressive medieval towers of San Gimignano as you pedal on to Pescille. San Gimignano is just a short cycle away; explore its myriad of narrow streets and many hidden cobbled squares before returning to your tranquil hotel for a refreshing dip in the sparkling swimming pool. It's a short ride to San Gimignano today before a climb up through classic Tuscan landscapes of vines, olive groves and fields ablaze with sunflowers. Enjoy the 16km, mainly downhill run into the Era Valley. There's a real sense of achievement on your final climb through open countryside and you'll enjoy spectacular views before heading back to the ancient cobbled streets of Volterra. RIDE PLUS - 59km / 37mi From the hotel you head towards San Gimignano circling the 'town of towers' for 360 degree views and passing through the surrounding wine country. Head uphill through vineyards and then enjoy a long downhill with views of the Volterra. Finishing with a climb into Volterra, pass through the town and ride back to your hotel for the last night. 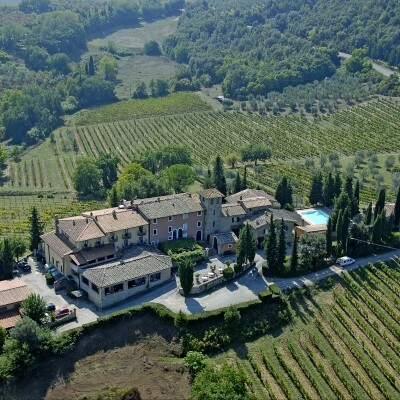 Hotel Le Renaie is a lovely family run 3 star hotel run by the Sabatini family in the pretty hamlet of Pancole, midway between San Gimignano and Certaldo. 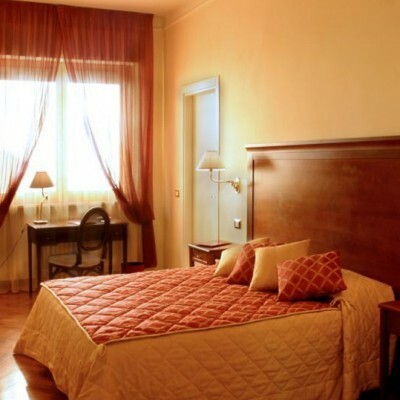 The hotel started life as a restaurant but over time, it has grown into the charming 25 room hotel it is today. The bedrooms are spacious and decorated in a traditional style. All have ensuite bathroom facilities. Surrounding the hotel is a pretty terrace with bright flowers and scented gardens. There is an outdoor pool, a tennis court and a shop which sells wine as well as the family's own home grown and produced olive oil. Room upgrades: Double Room with a Balcony. Deluxe rooms have a private balcony. I was initially somewhat trepidatious about attempting a' two and a half cycle' difficulty holiday with my younger, fitter, regular cyclist husband and so ,probably, was he. I am dog walking fit and that's about it. Some of the hills were fairly challenging but the bikes supplied have plenty of gears and the views from the top and the downhills are well worth the effort involved getting up and I was never that far behind him in the end! We went in September during the grape harvest, a lovely time of year. I'm not sure I would have coped with the cycling quite so well in July or August! The reps were very helpful but not intrusive and the hotels were all good. My husband is a map man and thought the quality of maps supplied was poor so we used the written instructions which were accurate and detailed. You don't need to be an olympic athlete to get the most out of this holiday, you have all day to complete the 40k between hotels, just take your time and enjoy those views! This was our first Headwater Cycling Holiday and our first visit to Tuscany, we felt that we were able to get up close and personal with the beautiful countryside. We would recommend this type of activity to anyone, we had a wonderful time and we look forward to booking another trip soon. It is possible to hire electric bikes for this holiday at a supplement of £210 per person. As these are available on a first come first served basis, we recommend early booking to avoid disappointment. It is possible to hire tandem bikes for this holiday at a supplement of £165 per bike. As these are available on a first come first served basis, we recommend early booking to avoid disappointment. Road bikes (Willer Ultegra) are available at a supplement of £288 per person. As these are available on a first come first served basis, we recommend early booking to avoid disappointment. Due to the tailor-made nature of our holidays, we need a little more information in order for us to check availability for Secrets of San Gimignano Cycling. Simply complete the form below and a member of our sales team will contact you (when it's most convenient for you) to provide availability information, travel options and an accurate price. Of course there's no obligation, but if you do wish to proceed with a booking they will be on-hand to assist you throughout the process.